The Tonerre in Cape Town. 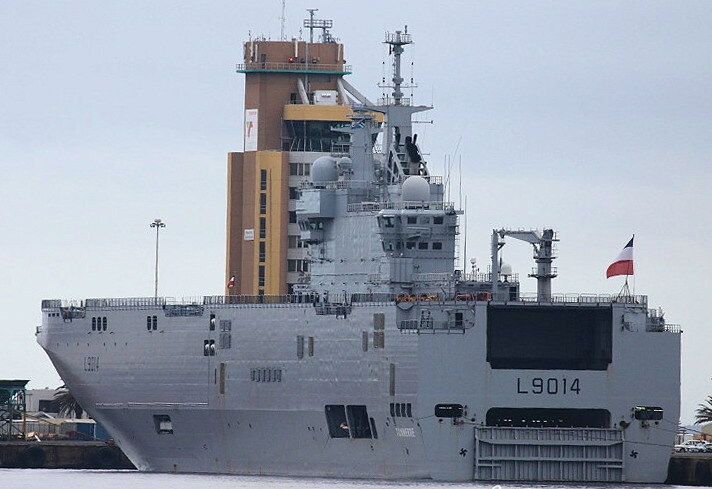 French task force “Jeanne d’Arc” 2019, a five month operational deployment of a two-vessel amphibious battle group, arrived in Cape Town on the morning of 12 April, having provided humanitarian assistance to those badly affected by Cyclone Idai in Mozambique. The annual “Jeanne d’Arc” mission is a French Navy (Marine Nationale) joint and allied operational deployment focused on on-the-job training for Naval College (École Navale) cadet officers and international cooperation, allowing young midshipmen to get on-the-job training at sea, thus learning the complexity of missions and operational theatres. For the 2019 iteration, built around the landing helicopter dock (LHD) Tonnerre and frigate La Fayette, the young men and women who left their home port of Toulon on 25 February will gain intimate knowledge of the planning and replanning required to account for unforeseen circumstances. Having participated in Operation Sea Guardian (the NATO maritime security operation in the Mediterranean) and amphibious exercises in Egypt and Djibouti, the task group joined Operation Atalanta, the European counter-piracy operation off the Horn of Africa and in the Western Indian Ocean. Speaking to defenceWeb aboard LHD Tonnerre, the vessel’s Commanding Officer, Captain Ludovic Poitou related how they were conducting operations under Operation Atalanta when France answered Mozambique’s request for international help and assistance arising from the devastation brought about by Cyclone Idai in mid-March. On 22 March a French Air Force C-160 Transall made the first airlift of emergency humanitarian logistical equipment (tents, generators, lighting kits, tools, etc.) between Reunion and Beira. The light surveillance frigate Le Nivose departed Reunion the following day and integrated into the task group. Maximum use was made of the amphibious capabilities afforded by Tonnerre, with its landing craft delivering aid to where it was most required. As all roads had been washed away or impassable, aid from Tonnerre was delivered by an EDA-R (Engin de débarquement amphibie rapide) Roll-on/Roll-off catamaran landing craft and two CTM landing craft, making use of small jetties in secluded areas and going upstream in rivers so as to deliver aid as close as possible to the devastated areas. For the “Jeanne d’Arc” 2019 mission, Tonnerre is carrying a French Navy Alouette III and two French Army Gazelle light helicopters. “We used the helicopters essentially for reconnaissance, so as to be able to focus on those areas that require more immediate aid,” Poitou said. The French initially commenced operations to the north in the area of Chinde but realised that the region had not been that impacted by the hurricane, thus they moved south with helicopters. The task force spent around ten days assisting Mozambique, landing their helicopters alongside those of the South African Air Force at Beira airport. One of the goals for “Jeanne d’Arc” 2019 is to conduct sovereignty missions for the protection of French maritime areas and the plan was that following its participation in Operation Atalanta, the task group would patrol in the Mozambique Channel, reinforcing the French presence around Mayotte and other French economic areas. “Once Nivôse had contributed to the Mozambican aid mission, I sent Le Nivôse back with La Fayette and they continued the patrol in the Mozambican Channel and we (Tonnerre) continue on our own delivering aid for the last week,” Poitou said. Upon the completion of her aid mission, Tonnerre was re-joined by La Fayette and they continued their journey south to Cape Town, where she dominates the harbour skyline. In addition to the customary “business of a ship making a port call in a friendly country where we are used to cooperating with the armed forces,” the senior officers of the task force will be visiting the South African Navy headquarters in Simon’s Town for discussions about the two navies working together to further cooperation. South Africa already holds a regular joint maritime exercise with France, namely Exercise Oxide and French naval vessels make regular ship calls to South African ports. Whilst there will not be any joint exercise between the two navies during the current port call, the two navies have already conducted common diving operations, performing hull inspections. For now, the 350 crew aboard the two French vessels, plus the 130 midshipmen are looking forward to enjoying all that Cape Town has to offer. The midshipmen include 79 ensigns (eight foreign officer cadets embedded in the class of 2016 of the French Naval Academy, 36 officers under long-term contracts, also known as the “OM/SC” career track, eight officer cadets of the supply services with naval specialisation and seven international invited young officers from the United Kingdom, Egypt, Morocco (2), Democratic Republic of Congo, Brazil and Australia. Following their departure on Friday 19 April, the task force heads across the southern Atlantic Ocean to Brazil, approaches to Guyana, the Caribbean Sea (Martinique, Colombia), the Gulf of Mexico (Mexico), the Sargasso Sea and the United States before heading back across the Atlantic Ocean via the Azores and finally, the Strait of Gibraltar and the Mediterranean for a return to Toulon in July. Barely two months into their journey, the sailors of Task Force “Jeanne d’Arc” have already illustrated the versatility, endurance and expertise required of French Navy sailors to fulfil their missions in a joint services and joint allied environment.